Successfully Added Nintendo Wii LCD Monitor 7 Inch to your Shopping Cart. Now you can play your Wii games wherever you are with this ultra portable Nintendo Wii Screen. Fitting this unit is easy just attach the base of this unit to the back of the Wii. All of the ports on the back of your unit are cloned (barring the AV connection as it goes to the screen) so you can simply plug in your Nintendo power cable and keep all of your USB accessories. A ventilation hole is even cut in to the unit to provide correct ventilation to the Wii's OEM fan. Extra AV ports are provided if you wish to hook up a DVD, Media player or another console and a car cigar lighter adaptor is provided for in car use. 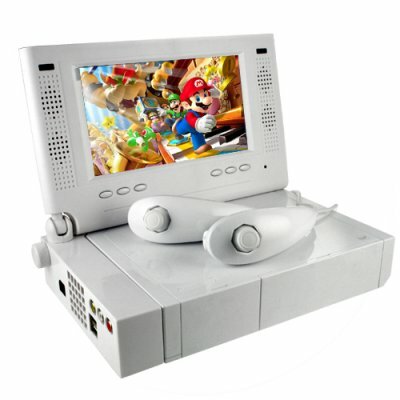 The screen is made on a ball and socket design to create freedom of movement an allow for an incredible array of viewing angles, a reverse/up/down picture control is available to for fixing the picture if you plan to mount your Wii in the roof of a car and have this unit fold down instead of up for example. When not in use your monitor is protected by folding perfectly flat against the wii. Another exciting new product that is sure to sell, order now at Chinavasion's wholesale prices with no MOQ or just get one for yourself so you can Wii anywhere! Adjustable Picture Settings -contrast, brightness etc. Fan Grill Hole so your Wii Won't Overheat.